Strategy needs information. Unfortunately, much of that information – particularly in Marketing – comprises of hand-me-downs or culled from a wish list. And yet, we live in an age that is choking with information, data, figures and statistics. Thus it seems incongruous that strategic plans are so ill-informed in such an information age. That’s why I’ve taken up learning how to scrape and transform on- and off-line data into some kind of insight…some kind of evidence that sets a direction. It hasn’t helped me with strategy work yet. But it is wow… just wow. I’ve learnt a new programming language (R), brushed up on my statistics, and made maps. Actually, a map of Instagram posts and likes on the Singapore General Election. I’m taking a break from blogging this week to settle a couple of things: funerals, army matters and yet-to-be-done work. Be back on 4 Apr with new posts! 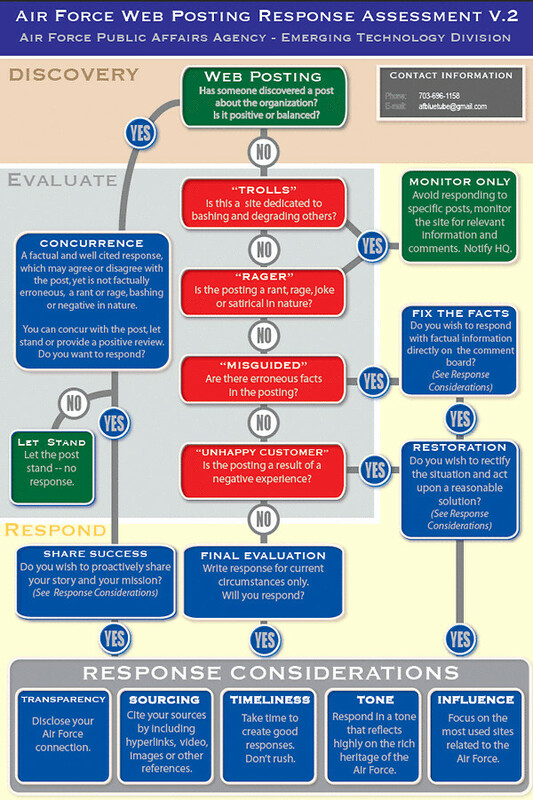 Meanwhile, check out the brilliant infographic on how to engage bloggers, courtesy of the USA Air Force (via GlobalNerdy). Frankly I’m surprised that a government body had actually done something about Social Media, instead of just paying it lip service. Now that’s putting your money where your mouth is! Loving this slide presentation by Stefanos Karagos. Check out slide 42 to 50 for steps on measuring Social Media ROI. MediaCorp, a local television company, had sent out an electronic Direct Mail (eDM) to clients and agencies canvassing for ad spots after news of the Japan Earthquake broke (details at Mr Brown). It’s crass and disrespectful to those who died in the earthquake. To their credit, MediaCorp released a statement apologising for their gaffe within 24 hours. Ironically their statement created another wave of disgust on Twitter. Tweeps said it was “pointless”, “A pretty weak apology from Mediacorp. Classless and tactless” amongst other things (reaction at Topsy). I once worked with editors who despised user-generated content (UGC). They called it fluff, biased, and not stringent. Deservedly so, because most UGC is crap (e.g. Camwhoring). But there’s also lots of good UGC on the web. You can’t beat them for their immediacy, rawness and, above all, honesty. Like this Youtube video of Tokyo’s 8.9 magnitude earthquake on Friday, 11 Mar 2011. It’s sobering as heck and a hell lot more heart-breaking than watching it on TV with newscaster voice-overs. Simply because it shows everything – warts and all. And that’s why I like User-Generated Content. Credit: Featured image from I M A U-M-N-B-N!